GLAST-1 is expressed in the central nervous system and is involved in L-glutamate and L- and D-aspartate transport. 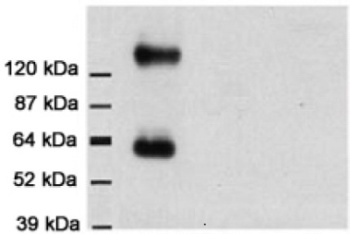 A 20 residue synthetic peptide derived from C-terminal domain of rat GLAST-1. * Nakajima K et al. Neurochem Int. 2017 Jan,102:1-12. * Nagata I. et al. J Comp Neurol. 2006 Nov 10,499(2):274-89. * Kohno H et al. Graefes Arch Clin Exp Ophthalmol. 2006 Jan:244(1):90-5. * Tominaga M. et al. Eur J Neurosci. 2005 Jun,21(11):2903-11. GLAST-1 is a transporter of L-glutamate and L- and D-aspartate expressed in the central nervous system.